Charvaka (IAST: Cārvāka), originally known as Lokāyata and Bṛhaspatya, is the ancient school of Indian materialism. Charvaka holds direct perception, empiricism, and conditional inference as proper sources of knowledge, embraces philosophical skepticism and rejects Vedas, Vedic ritualism and supernaturalism. Ajita Kesakambali is credited as the forerunner of the Charvakas, while Brihaspati is usually referred to as the founder of Charvaka or Lokāyata philosophy. Much of the primary literature of Charvaka, the Barhaspatya sutras (ca. 600 BCE), are missing or lost. Its teachings have been compiled from historic secondary literature such as those found in the shastras, sutras and the Indian epic poetry as well as in the dialogues of Gautama Buddha and from Jain literature. One of the widely studied principles of Charvaka philosophy was its rejection of inference as a means to establish valid, universal knowledge, and metaphysical truths. In other words, the Charvaka epistemology states that whenever one infers a truth from a set of observations or truths, one must acknowledge doubt; inferred knowledge is conditional. Charvaka is categorized as a heterodox school of Indian philosophy. It is considered an example of atheistic schools in the Hindu tradition. The etymology of Charvaka (Sanskrit: चार्वाक) is uncertain. Some believe it to mean "agreeable speech" or pejoratively, "sweet-tongued" (from Sanskrit's cāru "agreeable" and vāk "speech"). Others contend that it derives from the root charv meaning to eat possibly alluding to the philosophy's hedonistic precepts of "eat, drink, and be merry". Yet another theory believes it to be eponymous in origin, with the founder of the school being Charvaka, a disciple of Brihaspati. Bhattacharya notes that the word Charvaka is of irregular construction, as cara as an adjective means "agreeable, pleasant", but as a noun is another name of Brihaspati, and both derivations are plausible. According to Chattopadhyaya, the traditional name of Charvaka is Lokayata. It was called Lokayata because it was prevalent (ayatah) among the people (lokesu), and meant the world-outlook of the people. The dictionary meaning of Lokāyata (लोकायत) signifies "directed towards, aiming at the world, worldly". In early to mid 20th century literature, the etymology of Lokayata has been given different interpretations, in part because the primary sources are unavailable, and the meaning has been deduced from divergent secondary literature. The name Lokāyata, for example, is found in Chanakya's Arthashastra, which refers to three ānvīkṣikīs (अन्वीक्षिकी, literally, examining by reason, logical philosophies) – Yoga, Samkhya and Lokāyata. However, Lokāyata in the Arthashastra is not anti-Vedic, but implies Lokāyata to be a part of Vedic lore. Lokāyata here refers to logic or science of debate (disputatio, "criticism"). Rudolf Franke translated Lokayata in German as "logisch beweisende Naturerklärung", that is "logically proving explanation of nature". In 8th century CE Jaina literature, Saddarsanasamuccaya by Haribhadra, Lokayata is stated to be the Hindu school where there is "no God, no samsara (rebirth), no karma, no duty, no fruits of merit, no sin." The Buddhist Sanskrit work Divyavadana (ca. 200–350 CE) mentions Lokayata, where it is listed among subjects of study, and with the sense of "technical logical science". Shantarakshita and Adi Shankara use the word lokayata to mean materialism, with the latter using the term Lokāyata, not Charvaka. The terms Lokayata and Brhaspatya have been used interchangeably for the Charvaka philosophy of materialism. The tenets of the Charvaka atheistic doctrines can be traced to the relatively later composed layers of the Rigveda, while substantial discussions on the Charvaka is found in post-Vedic literature. The primary literature of Charvaka, such as the Brhaspati Sutra is missing or lost. Its theories and development has been compiled from historic secondary literature such as those found in the shastras (such as the Arthashastra), sutras and the epics (the Mahabharata and Ramayana) of Hinduism as well as from the dialogues of Gautama Buddha and Jain literature. Substantial discussions about the Charvaka doctrines are only found in texts after 600 BCE. Bhattacharya posits that Charvaka may have been one of several atheistic, materialist schools that existed in ancient India. Though there is evidence of its development in Vedic era, Charvaka emerged as an alternative to the Āstika schools as well as a philosophical predecessor to subsequent or contemporaneous nāstika philosophies such as Ājīvika, Jainism and Buddhism in the classical period of Indian philosophy. The earliest documented Charvaka scholar in India is Ajita Kesakambali. Although materialist schools existed before Charvaka, it was the only school which systematised materialist philosophy by setting them down in the form of aphorisms in the 6th century BC. There was a base text, a collection sūtras or aphorisms and several commentaries were written to explicate the aphorisms. There are alternate theories behind the origins of Charvaka. Bṛhaspati is sometimes referred to as the founder of Charvaka or Lokāyata philosophy. Billington states that a philosopher named Charvaka lived in or about the 6th century BC, who developed the premises of this Indian philosophy in the form of Brhaspati Sutra. These sutras predate 150 BC, because they are mentioned in the Mahābhāṣya (7.3.45). A.L. Basham, citing the Buddhist Samaññaphala Sutta, suggests six schools of heterodox, pre-Buddhist and pre-Jain, atheistic Indian traditions in 6th century BCE, that included Charvakas and Ajivikas. Charvaka was a living philosophy up to the 12th century in India's historical timeline, after which this system seems to have disappeared without leaving any trace. The Charvaka school of philosophy had a variety of atheistic and materialistic beliefs. They held perception to be the valid and reliable source of knowledge. The Charvaka school considers perception as the only reliable source of knowledge. The Charvaka epistemology holds perception as the primary and proper source of knowledge, while inference is held as prone to being either right or wrong and therefore conditional or invalid. Perceptions are of two types, for Charvaka, external and internal. External perception is described as that arising from the interaction of five senses and worldly objects, while internal perception is described by this school as that of inner sense, the mind. Inference is described as deriving a new conclusion and truth from one or more observations and previous truths. To Charvakas, inference is useful but prone to error, as inferred truths can never be without doubt. Inference is good and helpful, it is the validity of inference that is suspect – sometimes in certain cases and often in others. To the Charvakas there were no reliable means by which the efficacy of inference as a means of knowledge could be established. Charvaka's epistemological argument can be explained with the example of fire and smoke. Kamal states, that when there is smoke (middle term), one's tendency may be to leap to the conclusion that it must be caused by fire (major term in logic). While this is often true, it need not be universally true, everywhere or all the times, stated the Charvaka scholars. Smoke can have other causes. In Charvaka epistemology, as long as the relation between two phenomena, or observation and truth, has not been proven as unconditional, it is an uncertain truth. Such methods of reasoning, that is jumping to conclusions or inference, is prone to flaw in this Indian philosophy. Charvakas further state that full knowledge is reached when we know all observations, all premises and all conditions. But the absence of conditions, state Charvakas, can not be established beyond doubt by perception, as some conditions may be hidden or escape our ability to observe. They acknowledge that every person relies on inference in daily life, but to them if we act uncritically, we err. While our inference sometimes are true and lead to successful action, it is also a fact that sometimes inference is wrong and leads to error. Truth then, state Charvaka, is not an unfailing character of inference, truth is merely an accident of inference, and one that is separable. We must be skeptics, question what we know by inference, question our epistemology. This epistemological proposition of Charvakas was influential among various schools of in Indian philosophies, by demonstrating a new way of thinking and re-evaluation of past doctrines. Hindu, Buddhist and Jain scholars extensively deployed Charvaka insights on inference in rational re-examination of their own theories. 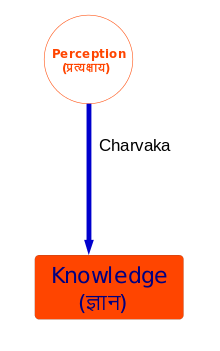 Charvaka epistemology represents minimalist pramāṇas (epistemological methods) in Hindu philosophy. The other schools of Hinduism developed and accepted multiple valid forms of epistemology. To Charvakas, Pratyakṣa (perception) was the one valid way to knowledge and other means of knowledge were either always conditional or invalid. Advaita Vedanta scholars considered six means of valid knowledge and to truths: Pratyakṣa (perception), Anumāṇa (inference), Upamāṇa (comparison and analogy), Arthāpatti (postulation), Anupalabdhi (non-perception, cognitive proof) and Śabda (word, testimony of past or present reliable experts). While Charvaka school accepted just one, the valid means of epistemology in other schools of Hinduism ranged between 2 and 6. Since none of the means of knowing were found to be worthy to establish the invariable connection between middle term and predicate, Charvakas concluded that the inference could not be used to ascertain metaphysical truths. Thus, to Charvakas, the step which the mind takes from the knowledge of something to infer the knowledge of something else could be accounted for by its being based on a former perception or by its being in error. Cases where inference was justified by the result were seen only to be mere coincidences. Therefore, Charvakas denied metaphysical concepts like reincarnation, an extracorporeal soul, the efficacy of religious rites, other worlds (heaven and hell), fate and accumulation of merit or demerit through the performance of certain actions. Charvakas also rejected the use of supernatural causes to describe natural phenomena. To them all natural phenomena was produced spontaneously from the inherent nature of things. By whom came this variety ? from their own nature was it born. Charvaka believed that there was nothing wrong with sensual pleasure. Since it is impossible to have pleasure without pain, Charvaka thought that wisdom lay in enjoying pleasure and avoiding pain as far as possible. Unlike many of the Indian philosophies of the time, Charvaka did not believe in austerities or rejecting pleasure out of fear of pain and held such reasoning to be foolish. The enjoyment of heaven lies in eating delicious food, keeping company of young women, using fine clothes, perfumes, garlands, sandal paste... while moksha is death which is cessation of life-breath... the wise therefore ought not to take pains on account of moksha. A fool wears himself out by penances and fasts. Chastity and other such ordinances are laid down by clever weaklings. Charvakas rejected many of the standard religious conceptions of Hindus, Buddhists and Jains, such as afterlife, reincarnation, samsara, karma and religious rites. They were critical of the Vedas, as well as Buddhist scriptures. The Sarvadarśanasaṃgraha with commentaries by Madhavacharya describes the Charvakas as critical of Vedas, materialists without morals and ethics. To Charvakas, the text states, the Vedas suffered from several faults – errors in transmission across generations, untruth, self-contradiction and tautology. The Charvakas pointed out the disagreements, debates and mutual rejection by karmakanda Vedic priests and jñānakanda Vedic priests, as proof that either one of them is wrong or both are wrong, as both cannot be right. Charvakas, according to Sarvadarśanasaṃgraha verses 10 and 11, declared the Vedas to be incoherent rhapsodies whose only usefulness was to provide livelihood to priests. They also held the belief that Vedas were invented by man, and had no divine authority. Charvakas rejected the need for ethics or morals, and suggested that "while life remains, let a man live happily, let him feed on ghee even though he runs in debt". The Jain scholar Haribhadra, in the last section of his text Saddarsanasamuccaya, includes Charvaka in six darśanas of Indian traditions, along with Buddhism, Nyaya-Vaisheshika, Samkhya, Jainism and Jaiminiya. Haribhadra notes that Charvakas assert that there is nothing beyond the senses, consciousness is an emergent property, and that it is foolish to seek what cannot be seen. The accuracy of these views, attributed to Charvakas, has been contested by scholars. No independent works on Charvaka philosophy can be found except for a few sūtras composed by Brihaspati. The 8th century Tattvopaplavasimha of Jayarāśi Bhaṭṭa with Madhyamaka influence is a significant source of Charvaka philosophy. Shatdarshan Samuchay and Sarvadarśanasaṅ̇graha of Vidyaranya are a few other works which elucidate Charvaka thought. In the epic Mahabharata, Book 12 Chapter 39, a villain who dresses up like a scholar, self appoints himself as spokesperson for all scholars, and who then advises Yudhishthira to act unethically, is named Charvaka. How shall it e'er again return? Ain-i-Akbari, a record of the Mughal Emperor Akbar's court, mentions a symposium of philosophers of all faiths held in 1578 at Akbar's insistence. In the text, the Mughal historian Abu'l-Fazl ibn Mubarak summarizes Charvaka philosophy as "unenlightened" and that their literature as "lasting memorials to their ignorance". He notes that Charvakas considered paradise as "the state in which man lives as he chooses, without control of another", while hell as "the state in which he lives subject to another's rule". On state craft, Charvakas believe, states Mubarak, that it is best when "knowledge of just administration and benevolent government" is practiced. Sanskrit poems and plays like the Naiṣadha-carita, Prabodha-candrodaya, Āgama-dambara, Vidvanmoda-taraṅgiṇī and Kādambarī contain representations of the Charvaka thought. However, the authors of these works were thoroughly opposed to materialism and tried to portray the Charvaka in unfavourable light. Therefore, their works should only be accepted critically. "Though materialism in some form or other has always been present in India, and occasional references are found in the Vedas, the Buddhistic literature, the Epics, as well as in the later philosophical works we do not find any systematic work on materialism, nor any organised school of followers as the other philosophical schools possess. But almost every work of the other schools states, for refutation, the materialistic views. Our knowledge of Indian materialism is chiefly based on these." Bhattacharya states that the claims against Charvaka of hedonism, lack of any morality and ethics and disregard for spirituality is from texts of competing religious philosophies (Buddhism, Jainism and Hinduism). Its primary sources, along with commentaries by Charvaka scholars is missing or lost. This reliance on indirect sources raises the question of reliability and whether there was a bias and exaggeration in representing the views of Charvakas. Bhattacharya points out that multiple manuscripts are inconsistent, with key passages alleging hedonism and immorality missing in many manuscripts of the same text. The Skhalitapramathana Yuktihetusiddhi by Āryadevapāda, in a manuscript found in Tibet, discusses the Charvaka philosophy, but attributes a theistic claim to Charvakas - that happiness in this life, and the only life, can be attained by worshiping gods and defeating demons. Toso posits that as Charvaka philosophy's views spread and were widely discussed, non-Charvakas such as Āryadevapāda added certain points of view that may not be of the Charvakas'. Buddhists, Jains, Advaita Vedantins and Nyāya philosophers considered the Charvakas as one of their opponents and tried to refute their views. These refutations are indirect sources of Charvaka philosophy. The arguments and reasoning approach Charvakas deployed were significant that they continued to be referred to, even after all the authentic Charvaka/Lokāyata texts had been lost. However, the representation of the Charvaka thought in these works is not always firmly grounded in first-hand knowledge of Charvaka texts and should be viewed critically. Likewise, states Bhattacharya, the charge of hedonism against Charvaka might have been exaggerated. Countering the argument that the Charvakas opposed all that was good in the Vedic tradition, Dale Riepe states, "It may be said from the available material that Cārvākas hold truth, integrity, consistency, and freedom of thought in the highest esteem." 1 2 Cowell and Gough, p. 5. ↑ R Thomas (2014), Hindu Perspectives on Evolution: Darwin, Dharma, and Design. Sociology of Religion, Vol. 75, No. 1, pages 164-165, Quote: "some of the ancient Hindu traditions like Charvaka have a rich tradition of materialism, in general, other schools..."
V.V. 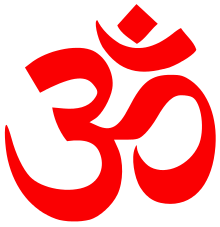 Raman (2012), Hinduism and Science: Some Reflections, Zygon - Journal of Religion and Science, 47(3): 549–574, Quote (page 557): "Aside from nontheistic schools like the Samkhya, there have also been explicitly atheistic schools in the Hindu tradition. One virulently anti-supernatural system is/was the so-called Charvaka school." 1 2 N. V. Isaeva (1 January 1993). Shankara and Indian Philosophy. SUNY Press. p. 27. ISBN 978-0-7914-1281-7. Retrieved 31 December 2013. ↑ Sharma, Chandradhar (1987). A critical survey of Indian philosophy (Reprinted. ed.). Delhi: M. Banarsidass. p. 40. ISBN 9788120803657. Retrieved 7 July 2015. ↑ Chattopadhyaya, Debiprasad (1992). Lokayata: A Study in Ancient Indian Materialism (7th ed.). New Delhi: People's Publishing House. p. 1. ISBN 81-7007-006-6. ↑ Bhattacharya 2002, p. 6. ↑ CV Vaidya (2001). Epic India, Or, India as Described in the Mahabharata and the Ramayana. Asian Educational Services. p. 503. ISBN 978-81-206-1564-9. Quote: These atheistical doctrines existed from the earliest times as their traces are visible even in the Rigveda in some hymns of which Prof Max Muller pointed out the curious traces of an incipient scepticism. (...) Two things are therefore clear that the Brihaspatya tenets also called Charvaka tenets are of a very old standing..."
1 2 3 4 5 Bhattacharya, Ramkrishna. Materialism in India: A Synoptic View. Retrieved 27 July 2012. 1 2 see Schermerhorn (1930). ↑ Bhattacharya 2011, pp. 55–67. ↑ Cowell and Gough, p. 9. 1 2 See verses 78-end (ET99-end) in Potter, Karl H. (2007). The Encyclopedia of Indian Philosophies: Buddhist philosophy from 350 to 600 A.D. Delhi: Motilal Banarsidass Publications. pp. 435–436. ISBN 978-81-208-1968-9. ↑ Joshi, Dinkar. Glimpses of Indian Culture. Star Publications (P) Ltd, Delhi. P. 37. ISBN 81-7650-190-5. 1 2 Cowell and Gough, p. 2. Bhattacharya, Ramakrishna (2011). Studies on the Carvaka/Lokayata (Cultural, Historical and Textual Studies of Religions. Anthem. ISBN 0857284339. Bhattacharya, Ramakrishna (2002). "Cārvāka Fragments: A New Collection". Journal of Indian Philosophy. 30 (6): 597–640. Chattopadhyaya, Debiprasad (1959) Lokayata: A Study in Ancient Indian Materialism. New Delhi: People's Publishing House. Chattopadhyaya, Debiprasad (1964) Indian Philosophy: A Popular Introduction. New Delhi: People's Pub. House. Chattopadhyaya, Debiprasad (1994). Carvaka/Lokayata: An Anthology of Source Materials and Some Recent Studies. New Delhi: People's Publishing House. Cowell, E. B.; Gough, A. E. (2001). The Sarva-Darsana-Samgraha or Review of the Different Systems of Hindu Philosophy: Trubner's Oriental Series (Partial Translation). Taylor & Francis. ISBN 978-0-415-24517-3. Gokhale, Pradeep P. The Cārvāka Theory of Pramāṇas: A Restatement, Philosophy East and West (1993). Koller, John M. Skepticism in Early Indian Thought, Philosophy East and West (1977). Nambiar, Sita Krishna (1971). Prabodhacandrodaya of Krsna Misra. Delhi: Motilal Banarasidass. Phillott, D. C. (ed.) (1989) . The Ain-i Akbari. by Abu l-Fazl Allami, trans. Heinrich Blochmann (3 vols. ed.). Delhi: Low Price Publications. ISBN 81-85395-19-5. Radhakrishnan, Sarvepalli and Moore, Charles (1957). A Source Book in Indian Philosophy. Princeton University Press. ISBN 0-691-01958-4. Riepe, Dale (1964). The Naturalistic Tradition of Indian Thought (2nd ed.). Delhi: Motilal Banarsidass. Salunkhe, A. H. Aastikashiromani Chaarvaaka (in Marathi). Schermerhorn, R. A. When Did Indian Materialism Get Its Distinctive Titles?, Journal of the American Oriental Society (1930). Sen, Amartya (2005). The Argumentative Indian: Writings on Indian History, Culture and Identity. London: Allen Lane. ISBN 0-7139-9687-0.